The CarbonTracker (CT) model has been used in previous studies for understanding and predicting the sources, sinks, and dynamics that govern the distribution of atmospheric CO2 at varying ranges of spatial and temporal scales. However, there are still challenges for reproducing accurate model-simulated CO2 concentrations close to the surface, typically associated with high spatial heterogeneity and land cover. In the present study, we evaluated the performance of nested-grid CT model simulations of CO2 based on the CT2016 version through comparison with in-situ observations over East Asia covering the period 2009–13. We selected sites located in coastal, remote, inland, and mountain areas. The results are presented at diurnal and seasonal time periods. At target stations, model agreement with in-situ observations was varied in capturing the diurnal cycle. Overall, biases were less than 6.3 ppm on an all-hourly mean basis, and this was further reduced to a maximum of 4.6 ppm when considering only the daytime. For instance, at Anmyeondo, a small bias was obtained in winter, on the order of 0.2 ppm. The model revealed a diurnal amplitude of CO2 that was nearly flat in winter at Gosan and Anmyeondo stations, while slightly overestimated in the summertime. The model’s performance in reproducing the diurnal cycle remains a challenge and requires improvement. The model showed better agreement with the observations in capturing the seasonal variations of CO2 during daytime at most sites, with a correlation coefficient ranging from 0.70 to 0.99. Also, model biases were within −0.3 and 1.3 ppm, except for inland stations (7.7 ppm). • Model-simulated CO2 concentrations are evaluated with in-situ observations at diurnal and seasonal time scales. • The model performs better in reproducing the daytime CO2 concentrations than the nighttime. • The model captures well the seasonal variations of CO2 concentrations during daytime at most sites. Supplementary material is available in the online version of this article at https://doi.org/10.1007/s00376-019-8150-x. 在以往的研究中, CarbonTracker(CT)模型可用于理解和预测在不同空间和时间尺度范围内控制大气CO2分布的源, 汇和动力过程. 然而, 精确再现接近地表的CO2模型模拟浓度仍然存在挑战, 这通常与较高的空间异质性和土地覆盖相关. 在本研究中, 通过与2009-2013年期间东亚现场观测数据进行比较, 我们评估了基于CT2016版本的嵌套网格CT模型模拟CO2的性能. 我们选择了位于沿海, 偏远, 内陆和山区的站点, 并且将结果进行日变化和季节时间尺度的展示. 在各个目标站点, 在捕捉CO2日变化方面, 模式和观测的一致性是不同的. 总体而言, 全部24小时的平均偏差小于6.3 ppm, 当仅考虑白天时, 偏差进一步降低, 最大偏差为4.6 ppm. 例如, 在Anmyeondo站点, 冬季的模式与观测的偏差较小, 大约为0.2ppm. 该模型揭示了冬季在Gosan和Anmyeondo站点, CO2浓度几乎无日变化, 而在夏季与观测相比则被轻微高估. 该模型在再现CO2日变化方面的表现仍然是一项挑战, 需要改进. 该模型在模拟大多数站点处的白天的CO2季节变化时与观测数据符合的更好, 相关系数在0.70~0.99之间. 其中, 模型与观测的偏差在-0.3和1.3 ppm之间, 内陆站点除外(偏差为7.7 ppm). 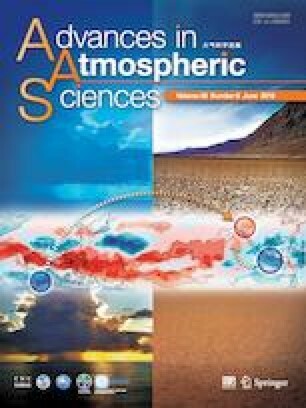 This work was supported by the Korea Meteorological Administration Research and Development Program “Research and Development for KMA Weather, and Earth system Services-Development and Assessment of AR6 Climate Change Scenarios” under Grant (KMA2018-00321). We gratefully acknowledge those who provided the access to the in-situ data at the WDCGG (https://ds.data.jma.go.jp/gmd/wdcgg/cgi-bin/wdcgg/catalogue.cgi).